Let me start by stating that I’ve never been much of a beer drinker but with so many good local breweries in my own backyard I figured it is never too late to start! Seized by an urge to investigate our local world of micro-breweries, we recently embarked on an impromptu beer tasting tour that turned into a full day brewery adventure in northern Sonoma and Mendocino counties. 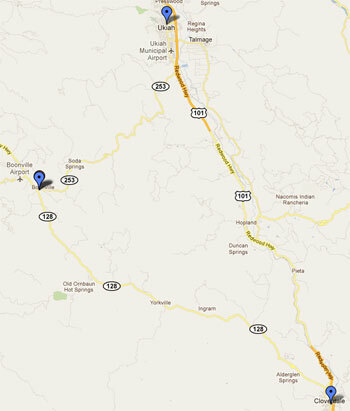 From Cloverdale to Ukiah and as far as Boonville we imbibed at three distinct breweries that teemed with local character, good food, and an abundance of brews. Our first stop of the day: Ruth McGowan’s Brewpub in Cloverdale. Tucked away on the edge of downtown this nine year old brewery and restaurant welcomed us with small town hospitality and a surprising number of beers. People were already starting to fill up the spacious shaded porch; sipping cold beers in a hot breeze. 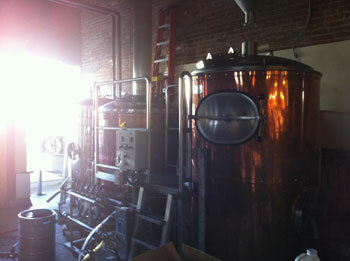 Inside, a long L-shaped bar stretched around the room with gleaming copper tanks peaking up from behind. Some families were just finishing up their brunches (served Sat/Sun 10am-2pm); little kids scratched away with crayons on their coloring menus. We arrived just in time for lunch and I filled up on a well done Reuben sandwich (although the beer battered fish and chips looked like an excellent choice) before starting in on our flight of eight beers in all shades of amber: from Caroline’s Blonde to the McGowan’s Dry Irish Stout. Our son danced on the stage in their backroom while we let our tasters settle; live local bands play in the evenings – Jazz on Sundays (call for details). 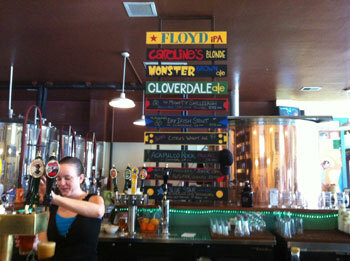 Our brewery hopping was off to a good start; we left with a growler (half gallon takeaway) of their Cloverdale Ale. Next on the itinerary: Andersen Valley Brewing Company in Boonville. For the second year in a row (completely unplanned both times) we arrived in Boonville on the final day of the Sierra Nevada World Music Festival. This made Boonville a particularly bustling place with very entertaining people watching. The brewery, with its adjacent campground, was a hive of activity. The spacious building and shady patio provided a cool escape from the hot day and kept a parade of people filing through to fill up on AVBC’s award winning brews. A retired bottling machine greeted us as we came through the doors; a long copper topped bar lined with tractor seat stools stood off to the side. A giant chalk board full of beers hovered overhead with the words “Boont Steinber = Bahl Hornin’” at the top (Boonville beer = good drinking, in the historic local boontling language). We went for a flight of twelve beers, comparing some of their more familiar styles like the Imperial IPA with some of the draft-only varieties like Wee Geech. The Wee Geech won our vote and we left with our second growler of the day. After our tasting we walked into town in search of a snack and discovered towering rows of trellises behind the brewery. From a distance they looked like the most amazing bean vines I’d ever seen but a dread-locked passer-by informed us, “Those are hops!” Of course! In town we saw festival-goers decked out in all manner of creative clothing designed for dancing. We passed a young woman wearing a mini-skirt adorned with a coin belly chain; she was painted from the waste up in bright colors and glitter with two strategically placed star pasties. My son’s eyes widened and he said, “Wow mom! Look at that!” Everyone around us, including the woman, busted out in laughter. At 3 ½ he’d never seen someone wear glitter before! Boonville is home to the Mendocino County Fairgrounds so it plays host to many events. The Mendocino County Fair is coming up in September where you’re sure to find more cowboy boots than coin belly chains. Finally, for our last stop of the day: the Ukiah Brewing Company. This brewery has a unique claim to fame; it is the first organic brewpub in the nation. Situated in a charming historic building in downtown Ukiah the brewery-restaurant has a cozy feeling; an old brick wall rises up behind their beautiful antique wooden bar in room full of comfortably worn booths and chairs. Their organic restaurant (second one in the country) features both meat-friendly and vegetarian/vegan items, with a very well done fish and chips (the quintessential pub food). There was a stage in the front of the restaurant where bands crank up in the evenings (check their website for a schedule). In the corner, my son discovered a stack of kid’s book to keep him busy while we waited for our food. In a second room we found two gleaming rows of beer tanks. The beer menu consisted of seven styles, including the very distinctive Emancipator and Renegade. We tasted them all but were most compelled by the 1889 Mild, a 100 year English style beer, and added a third growler to our growing collection. After a relaxing post-dinner walk around the nearby historic homes, we drove the distance home to Petaluma. Without much planning we had stumbled into a fantastic day. 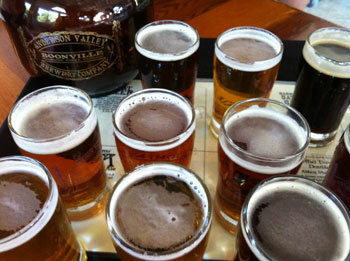 Beer tasting, it turns out, is a more relaxed and family friendly activity than wine tasting. Food and entertainment are often part of the package and the more casual atmosphere is better suited to wrestles children. We were able to try a wide variety of beers, visit towns we didn’t know well, enjoy scenic drives and some very good meals. My beer palate took a giant leap forward and my husband and I were inspired to start making some of our own beer. Our first batch of pale ale is gurgling in the corner of our kitchen as I write. The interim taste test indicated we were on track but only time will tell!! Our area has so much to offer! Let local travel inspire you to try something new!